I’m always looking for a quick and easy dinner solution. Being an independent momma often leads to being short on time. So over the next few months we are going to start exploring recipes that are simple to prepare and easy to cook. The first one up is from the cook book 200 Best Sheet Pan Meals. I’ve been looking through the book and I must admit some recipes look a little time consuming and there are various skill levels. But I also found several recipes that are perfect for weeknight meals. Many you could get ready the night before so it’s just a matter of placing them on the sheet and tossing it in the oven. 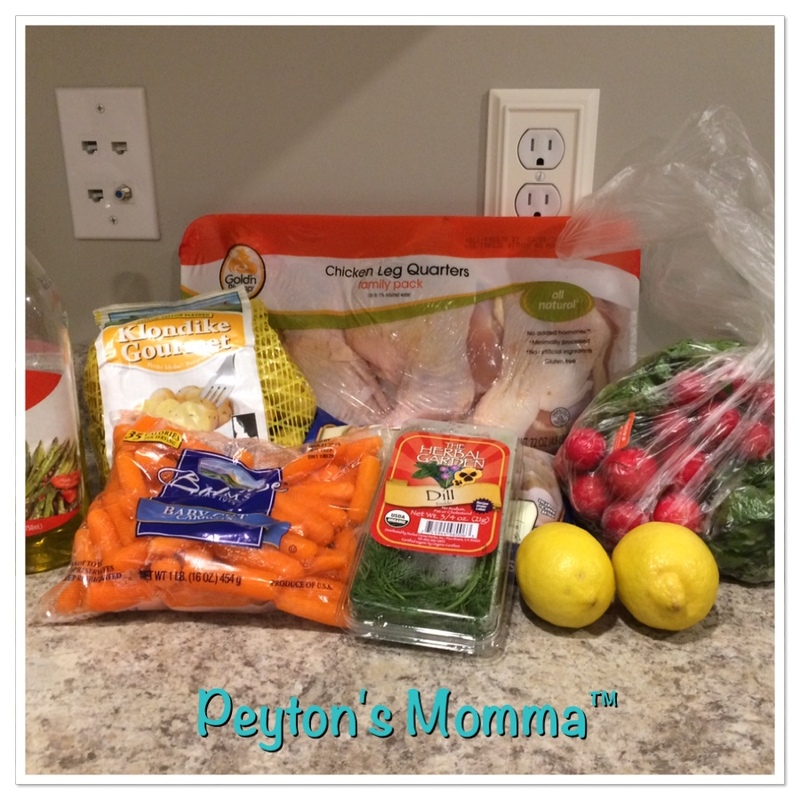 My first adventure with 200 Best Sheet Pan Meals is the Roast Chicken Quarters with Lemon-Dill Spring Vegetables. When you are ready to cook here’s what you need to do, preheat the oven to 500. 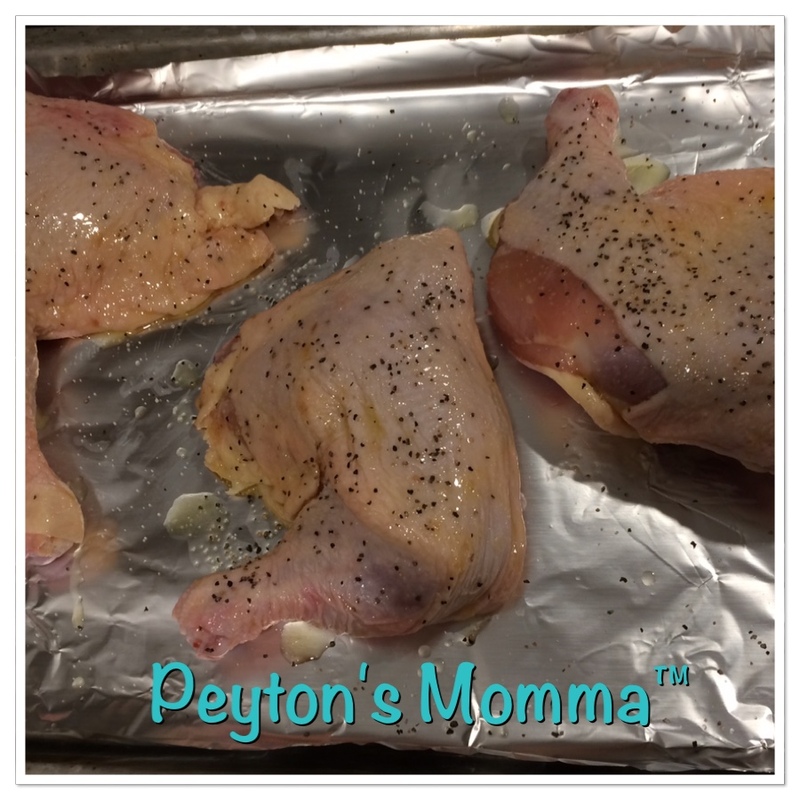 While the oven is preheating take your chicken quarters and arrange them on your sheet pan. Then lightly brush them with 1 tbsp of oil. Do not over use the oil. This will cause a grease fire. (I may be speaking from personal experience here but I will not confirm nor deny this. 😉 ) Next, season with salt and pepper and then roast in oven for 10 minutes. While the chicken is in the oven take out a big bowl. Toss in the onions, carrots, potatoes, radishes, 2 tbsp of oil, 3/4 tsp of salt and 1/2 tsp pepper. Mix this all together and make sure to get a nice coating on all the veggies. When the 10 minutes is up take the chicken out of the oven. Now arrange the veggies on the pan around the chicken and then place it all back in the oven. Roast this for about another 20 -25 minutes. A great indicator if it’s done is if the chicken skin is crispy, the veggies are tender and the thickest part of the chicken reads 165 for temp. If you have achieved all these then your meal is done! Remove from the oven. You can either leave your meal on the sheet pan or transfer it to a serving dish. But to be honest I’m not going to transfer it to a serving dish unless we have company. Why dirty another dish? Sprinkle the dish with the chopped dill, lemon juice and lemon zest. Do be fancy you could remove the veggies and do this in a bowl but again I’m not going to dirty another dish so I did this right on the pan. I thought this was a simple recipe to make. It was easy to get in the oven and would be perfect for a weeknight meal or if you were having company. 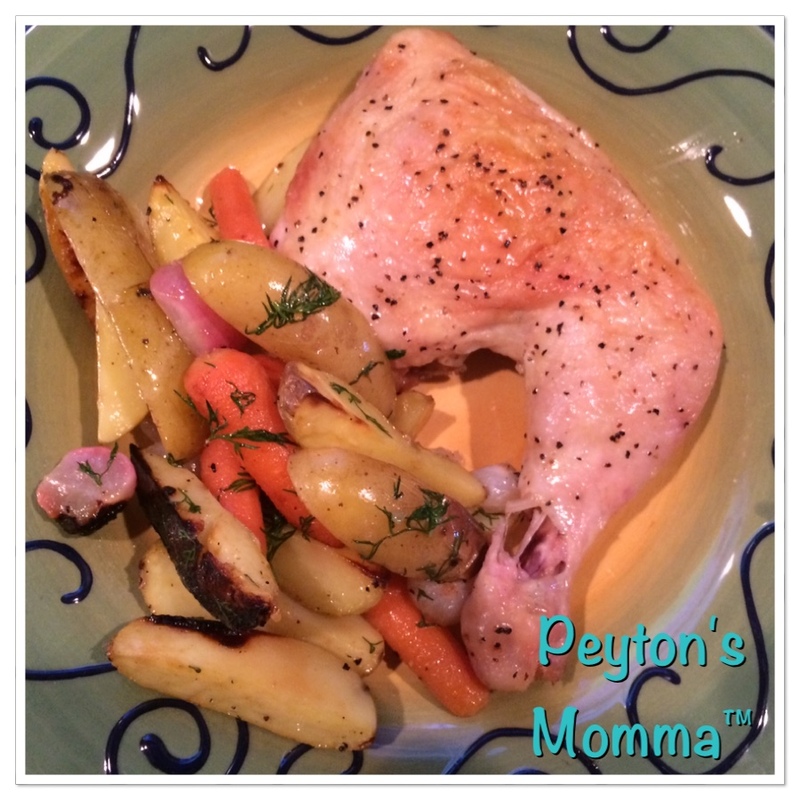 Peyton was not too crazy about the onions or radishes but she loved the carrots, chicken and potatoes. To make it more kid friendly you can shred the chicken before you serve it. I did that for Peyton and she loved it. Claimed it was the best chicken I’ve ever made. 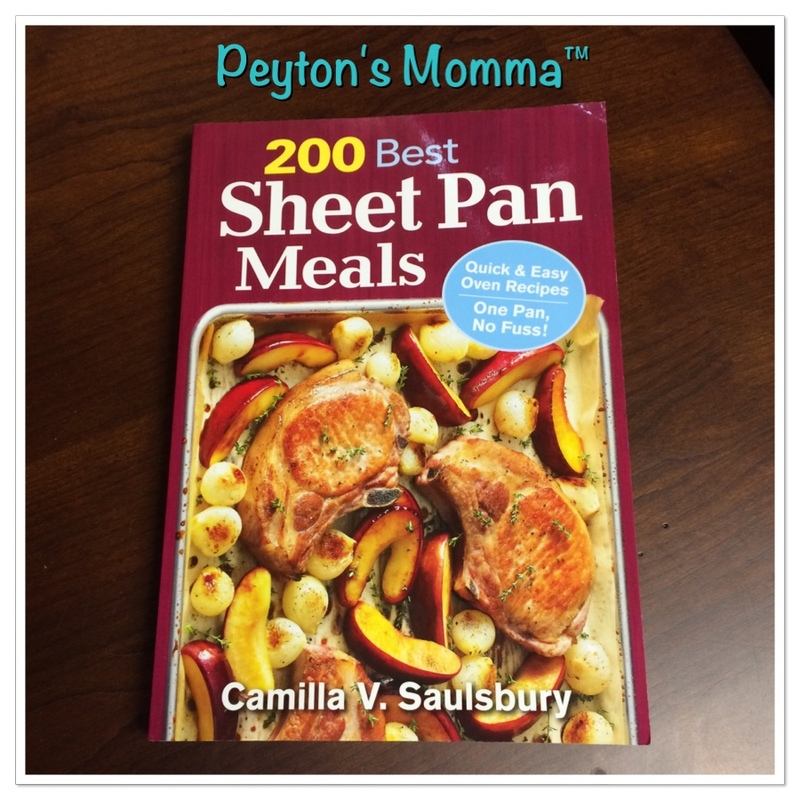 You can pick up your own copy of 200 Best Sheet Pan Meals on Amazon or your local book store. But I think we may be featuring more recipes from this book over the summer because it was so easy to prepare and tasted yummy! This sounds so yummy to me! I will have to give it a try. It was really good!! I never thought I would love roasted radishes. Just make sure to really brown the skin. The crispier the better. I should’ve left mine in for a little while longer. This sounds wonderful! I’ll have to make it soon! I appreciate the instructions on preparing this Roast Chicken Quarters in Lemon-Dill sauce. I have been looking for a recipe like this for years. Thanks so much for sharing.